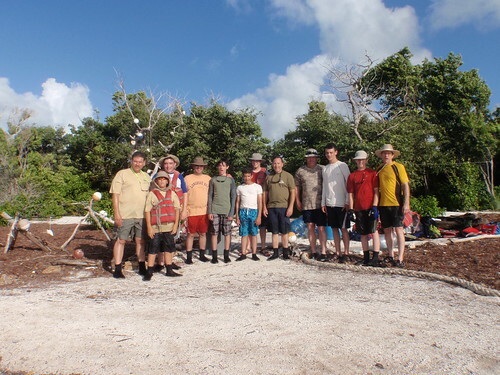 One last high adventure episode awaited some of Troop 353’s “survivors” as our week’s stay on Big Munson Island came to an end. After both crews packed their gear, cleaned up the campsites – leaving no trace – and took a few last photos, we slogged out one last time to the war canoes and got underway for the long pull back to Brinson. In an hour or so, we’d be enjoying hot showers and bedding down in cool air-conditioned comfort. But the ocean had other ideas. Stirred by high winds, a series of waves just offshore kept one of the war canoes from making its turn to run before the wind – and sea spilled over the gunnels, swamping us a few hundred yards from shore. 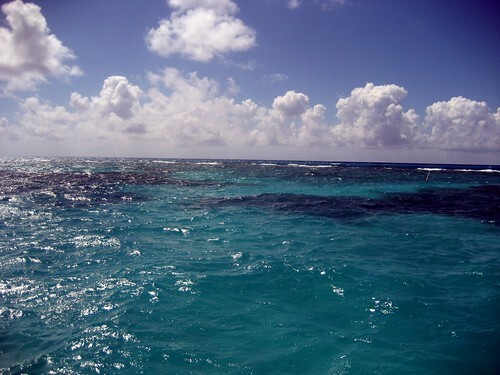 But seasoned after a week spend most wet – and often floating or swimming – the six-person crew and their island mate calmly assessed the situation. We were all wearing PFCs and treading water easily. We grabbed our gear bags, which were floating away, and lashed them together. Then we tried to refloat the war canoe. 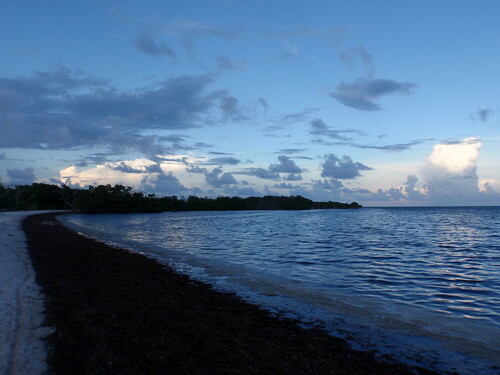 A couple hours later, with the help of a skiff and a Dusky dispatched from Brinson Center, we were paddling again – and another 90 minutes or so after that, we climbed wearily onto the dock on Summerland Key. Freshly-scrubbed and turned out in Hawaiian shirts and other festive gear, Troop 353’s contingent celebrated our salty passage with a luau at Brinson Center, complete with BBQ, games, contests of skill, songs and skits. 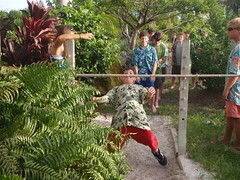 Everyone had a fantastic time – especially during the limbo contest – and we all slept well that night. Next morning brought breakfast, last-minute shopping in the Sea Base shop, adding the troop’s numbers to the rafters, and farewells to the terrific Sea Base crew. All the adult leaders agreed: what an impressive group of young leaders. Then we hit the road for Key West, where a festive dockside seafood lunch – after a little sightseeing – capped our week-long adventure. A couple of hours later, we sat back on our Jet Blue flight and watched the Florida coast disappear into the twilight. 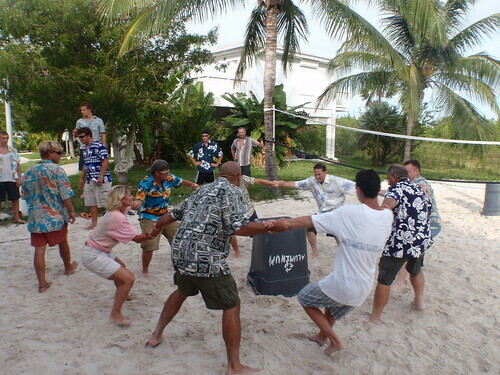 Sea Base 2009 – Sharks, Barracuda…and Cobbler? 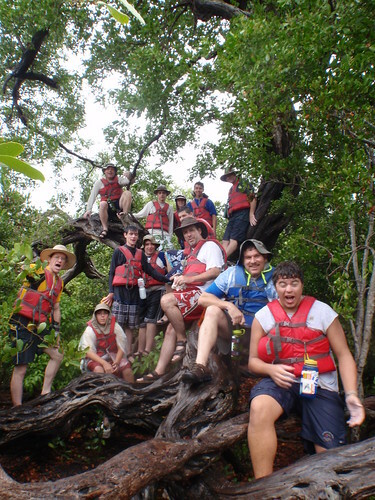 Troop 353’s last full day on Big Munson Island could hardly have packed more in, beginning in the water and ending amid the glow of a fire in a strange and mysterious forest clearing. After breakfast, all four of the crews on the island (including some Scouts from Pennsylvania) walked over to the “backyard” section of the beach and waded out a few hundred yards to Sea Base’s 55-foot dive boat, for the trip out to Looe Key, a prime Florida Keys dive spot that is one of the most visited sites in the world. We spent hours floating above the coral, spotting a wide variety of sea life – including a couple of sinister-looking barracuda and at least one good-sized reef shark. While the visibility wasn’t perfect – the winds from that pesky tropical storm were still stirring things up – the snorkeling was a lot of fun, and Looe Key offered a huge area of picturesque viewing. 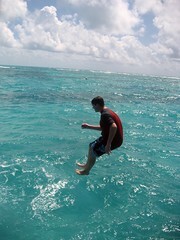 After lunch, the Scouts took part in several spirited aquatic contests, most of them featuring various leaps and jumps from the boat into the warm blue waters. The day was beautiful, with high clouds and light winds (that kept the bugs at bay during virtually all of our stay on the out island). Back on Munson, it was time for a service project: general clean-up and litter removal on one end of the island, as well as servicing one of the high-tech (really!) latrines. The clean-up was pretty interesting, mainly because of some of the debris we found washed ashore, some of it from Cuba and Jamaica. One find was particularly intriguing: Simon R. found a sealed bottle with a 20-dollar Cuban note, some coins and the photograph of a young man? A spiritual offering before a journey by sea? Or a memorial? We don’t know, but the bottle made its way into the museum shelves back at the Brinson Center. During the week, the crews also used some of the stuff they found washed up along the shore to decorate the entrance to each campsite, which generally featured a kind of primitive “front porch” to greet visitors. And it was on one of those porches that the big pot-luck supper and cobbler contest unfolded. The premise was simple: cook pretty much everything you had left and bring it for a huge group meal for everyone on the island – and then compete in a dessert-oriented cook-off. And Troop 353’s young chefs didn’t let down the side – we finished first and second, wowing the judges and pleasing their sweet tooths. Now, the night wasn’t over – but much of what transpired on that last evening is generally kept…well…confidential. Suffice to say, there’s a gathering with song and dance and incredible hilarity. No one will forget it. A conch shell was involved. Fiddler crabs took a leading role. A hand rose from the sand…but I’m afraid I’ve already gone too far. The details of that last night must be kept only for those who paddle those 5.5 nautical miles and float among sharks and jellyfish in the dark of night. 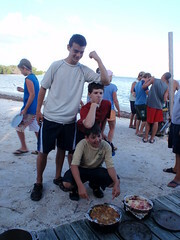 Author troop353Posted on August 23, 2009 April 4, 2010 Categories Acquatics, High Adventure, Sea BaseLeave a comment on Sea Base 2009 – Sharks, Barracuda…and Cobbler? Our first full day on Munson Island began with intermittent sun and warm temperatures – but it wouldn’t end that way. 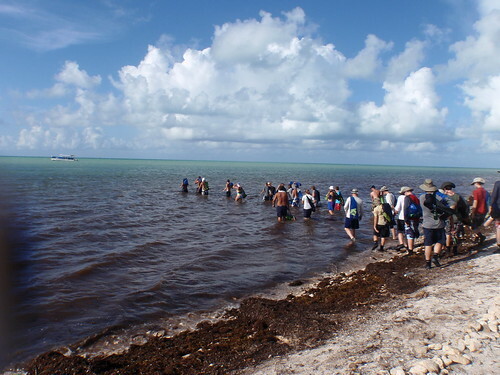 After breakfast, the crews walked over the the island’s northern side, facing the Keys, and small bay in the middle. We jumped into two-man ocean kayaks and set off on several miles of inland exploration among the mangroves. It was great fun to try and run the dense maze of tiny streams and low-lying growth, and make it back out in the ocean before paddling back – just in time, too, as the skies darkened, lightning flashed and thunder roared. For the next few hours, we tried to lay low in camp as the first tropical storm of the season hit the Florida mainland, just swatting us with its tail – enough for a couple of inches of rain of three or four hours and some violent thunder cells that rolled through one right the other. Tents flooded. Scouts got wet. We cooked lunch anyway, and waited it out. In the later afternoon, the weather dropped to a drizzle and led by our mates, we headed out to explore the island and learn a bit about the plant and animal life of Big Munson. During our stay, the time we spent outside of the water’s realm was passed in the thin shade of a tropical hardwood canopy – or “hammock” in the local parlance. The trees were low and scrubby, a bit like the coastal forests of south Jersey and eastern Maryland in scale, but with different species: gumbo limbo, mahogany, and the infamous poisonwood trees. A relative of the poison oak, poisonwood, we were told many times, packs ten times the stinging wallop of poison ivy and can be inflicted not just on contact but by rain dripping from his five-leaved branches. Of course, there were several just outside our tents; yet we managed to avoid the scourge. The hike around the island took us to an inland tidal pool, and through some of the low hammock forest, along with a good bit of the shoreline and a huge pile of conch shells. Some of the guys found some floats and debris to decorate the campsites. Then it was back to the soggy camps for dinner and clean-up. But the day wasn’t done. After dinner, we grabbed fishing poles and handlines and waded out to the twin floating docks, bobbing in neck-deep water several hundred yards offshore. The activity? A little evening shark fishing. Yeah, we threw some “chum” – boxes of fish pieces and blood – into the water around the docks to attract the sharks, then set out some handlines to catch a little more bait. We baited the books on the big boat poles and waited. Meanwhile, thunderstorms just off the coast lit the sky and rolled past us, as we bobbed on the docks. 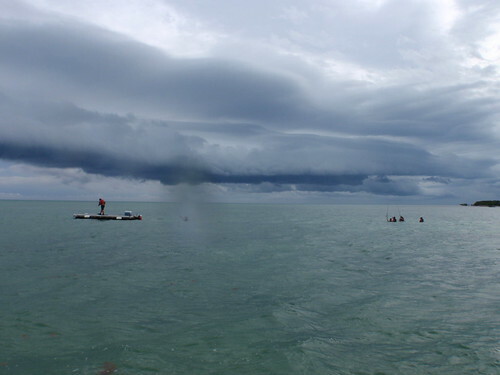 After about an hour with only hints at a bite – and with a couple of storms bearing down on us – we jumped into the chum-slick water (only a moment’s pause to consider we were now the bait), and slogged back, dragging ourselves to shore for the night. A long, tiring and very wet day – indeed, some of us had to bail our tents out before curling up to sleep. 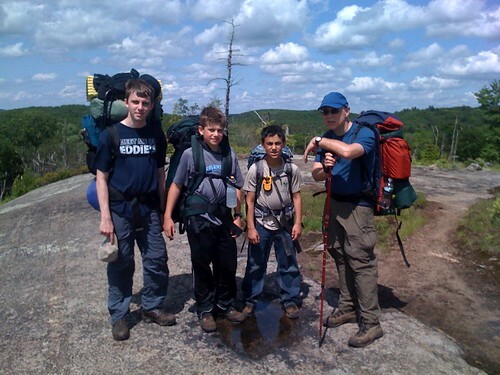 Although only a few scouts participated in our annual backpacking event in nearby Harriman State Park in early June, those that did had the memory of a lifetime. The weather was nearly ideal and not nearly has hot & humid as the year before. Our mini-trek’s lunch-time destination was Lemon Squeezer, where cool moist breezes characterize a labyrinth of rock formations. This area within Harriman St. Park is a natural magnet for adventurous hikers and backpackers alike. Our particularly curious scouts discovered a hidden entrance to a small cave and sought refuge in the coolness of the rock’s natural formation. Reluctant to leave this near-oasis, our group loaded up and headed out for our evening destination. Former Scoutmaster Don Wauchope led our hearty group to the targeted campsite with great purpose. Though our group began to get stretched out along the trail, the long hike up the mountain was soon forgotten upon arrival to a truly magnificent campsite nestled on a high ridge with an incredibly panoramic view of the river below. A dual-fireplaced lean-to also served as a major lookout tower. A rock cliff gave rise to climbing opportunities, that ASM Mike Dobbins soon discovered was best conquered with adequate safety precautions. Fortunately, a long-rope prevented him from sleeping on the side of the mountain that night and led to an opportunity to explain to the scouts later the values of knowing how to tie the Bowline knot! The stunning campsite was so popular and amply spacious that our crew shared it with two other camping parties. A full moon that night made for one of the more memorable camping experiences ever experienced by this old-timer! . 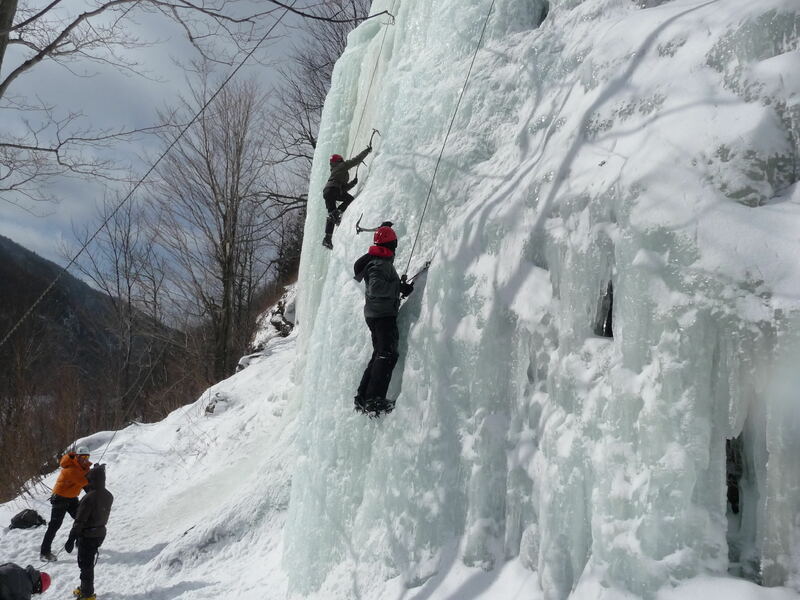 After waiting for two years for the opportunity to participate in our Council’s popular Ice Climbing event near Lake Placid in upstate New York, our older scouts (minimum age 14) finally got the opportunity to discover why this outing remains in such high demand. First of all, there are only a few weekends per year that this unique high-adventure trip is available. And relative to the size of Westchester-Putnam Council’s scout base, all ice climbing weekends typically “sell out” within a few weeks of becoming available in May the preceeding year. As well, the Summit Base crew does a terrific job to ensure scouts have an exciting, fun and safe weekend. For the scouts, whom are used to camping, staying in a warm Hostel with bathrooms and home-cooked meals is a bit like being on vacation! Finally, the ice climbing in the Keene Valley itself is spectacular! It is very challenging (much harder than it looks), the weather elements can be harsh, but the scenery is simply spectacular. Staying in Lake Placid, site of the 1932 & 1980 Olympic Games, had the added benefit of other important sporting events occurring, namely the Empire State Games with athletes from all over the world present. And if one still had any energy left from learning to work ice picks and spiked crampons in tandem on a magnificent vertical ice cliff all day, then one could play on the Lake Placid Toboggan Chute at night as long as one wanted. This new winter event for the troop, in all likelihood, will prove to be enormously popular. Words simply cannot adequately describe the exhilaration of ice climbing in the beautiful surroundings of Keene Valley. Simply spectacular photographs of this event can be seen here.